2018-10-23 19:59#251508 silentjay : Disabling BREXIT would be great. 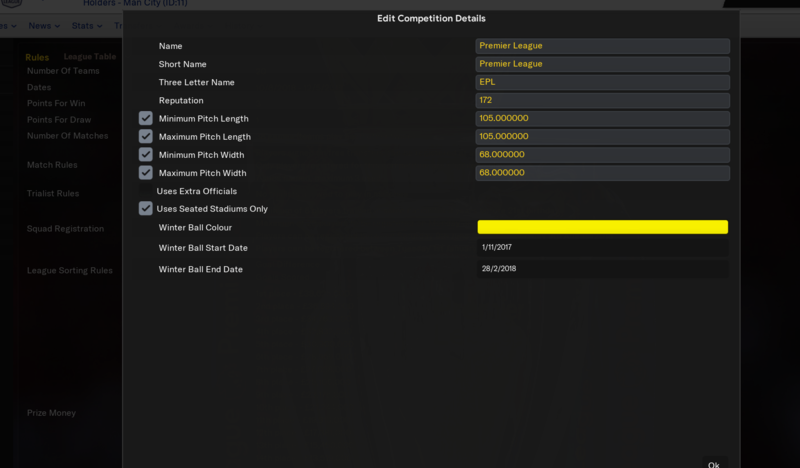 Not sure its possible but one thing I would love is to be able to edit my manager history. So I can add an entire playing career to my history or say, have a coaching role listed as a previous job, things like that. I know its extremely small and pretty dumb but would add to my immersion of my save. 2018-10-25 20:44#251574 ooshosboshe : Not sure its possible but one thing I would love is to be able to edit my manager history. So I can add an entire playing career to my history or say, have a coaching role listed as a previous job, things like that. I know its extremely small and pretty dumb but would add to my immersion of my save. Forgive me if it’s already been requested but a possible recommended CA figure when changing a few stats on a player. I don’t know what impact it has in game overall but I’d like the CA of a player to balance with his stats rather than guessing his stats to CA. Say I put 5 points in a player and then his 17 DM into a 20 DM it’s a lottery. I could be guessing he is now a 150 CA when he is actually a 147 CA or 152 CA. Many thanks for the hard work tho. It’s a fantastic tool and I am eagerly anticipating more future improvements. 2018-10-26 08:00#251598 shauneastham : Forgive me if it’s already been requested but a possible recommended CA figure when changing a few stats on a player. I don’t know what impact it has in game overall but I’d like the CA of a player to balance with his stats rather than guessing his stats to CA. Say I put 5 points in a player and then his 17 DM into a 20 DM it’s a lottery. I could be guessing he is now a 150 CA when he is actually a 147 CA or 152 CA. Many thanks for the hard work tho. It’s a fantastic tool and I am eagerly anticipating more future improvements. Could you integrate a feature that allows you to change the contract of the players character. It would be nice to give yourself a 5 year contract. @AgentGarcia: We haven't added anything about the human manager so far, besides the unsackable feature. The contract duration for players you can edit. I think it would good to be able to change whether VAR is enabled or not for a league, as far as i'm aware you can do this is in the in-game editor. 2018-11-03 19:49#251942 atimmins05 : I think it would good to be able to change whether VAR is enabled or not for a league, as far as i'm aware you can do this is in the in-game editor. One feature I would like to see added is the affiliate editing feature. I would like to be able to edit my clubs affiliates. Adding and removing affiliates. It would be nice to edit National teams. Managers etc. Any chance you can add the ability to add/remove VAR to competitions? Also i would like the ability to remove recurring injuries. Hello, It would be lovely if could add ability to modify the number of foreign player limitation rule in a league. You are reading "FMSE Feature Requests".